How can your brand take part in this hot topic on LinkedIn? Monday 27 November is Cyber Monday, the biggest online shopping day of the year – and also the day when businesses find themselves most vulnerable to the effects of cyber attacks. Cyber Monday sales play a vital role in retailers reaching their year-end targets, and that means any IT failures are potentially disastrous. It’s been estimated that 10 minutes of downtime for Amazon could result in $2 million in lost sales. For other retailers, the absolute numbers may be smaller, but the significance for their overall revenues is just as great. As a result, brands are focused on cyber security and IT capacity planning like never before – and that makes the conversation around Cyber Monday a hugely important one for relevant B2B brands to be involved with. Shoppers worldwide spent over $3.45 billion on Cyber Monday last year. Just as spending peaks over the next few weeks, the conversation around Cyber Monday on LinkedIn will as well. 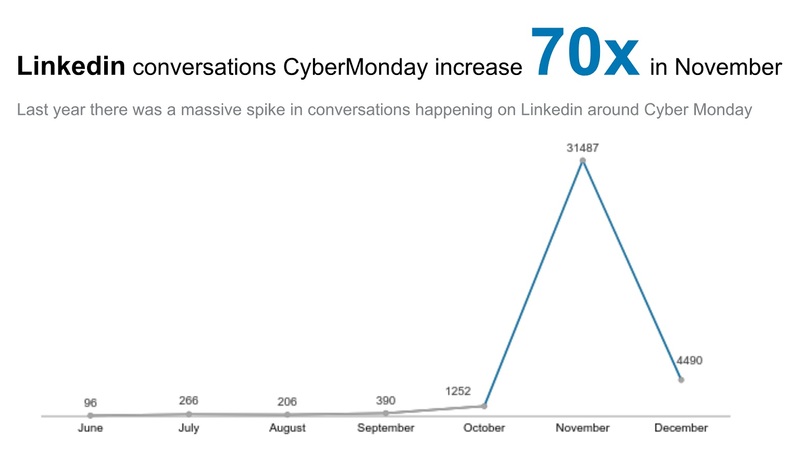 Last year, mentions of Cyber Monday on LinkedIn increased 70x during the month of November. 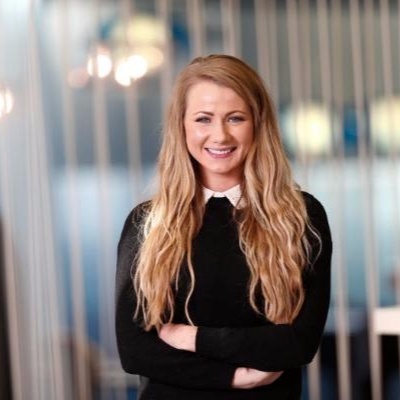 That creates a huge opportunity for any B2B marketer who can identify how this moment relates to their proposition – and a particular opportunity for those operating in the cyber security space. Cyber Monday was invented by B2C marketers looking to build shopper excitement – and on the face of it, it seems like a specifically B2C marketing event. However, for B2B marketers, ignoring a moment of this size is a massive missed opportunity. Our data shows that mentions of Cyber Monday on LinkedIn start to peak weeks before the event itself. Several of the strands of this conversation will be dominating the agenda of your key audiences. Cyber Monday brings obvious opportunity for a range of different businesses – but also huge pressures. Its importance to meeting retailers’ year-end targets means that marketing for the occasion has to hit the ground running – and IT failures are potentially disastrous. Drop the ball at any point in the customer journey and businesses will be missing out on crucial sales. It’s a long wait for the same opportunity to come around next year. Huge short-term rises in web traffic bring significant IT and management challenges too. There’s the question of capacity planning and the risk of websites being unable to cope, ensuring stock is aligned with demand, staffing call centres in readiness for any problems, and getting a handle on the logistics involved in the latter stages of the customer journey. A big surge in traffic can also disguise more malicious activity. As retailers and their IT departments focus on keeping things running, Cyber Monday is a golden opportunity for criminals to infiltrate systems and steal confidential information. Awareness is rapidly growing around the cyber security implications of Cyber Monday. It’s part of the reason why the LinkedIn members most engaged with the conversation are those working in IT – especially for large businesses. Online shopping’s big day also highlights the relationships of financial services brands with their customers. The challenges of spotting fraudulent behaviour increase significantly when consumers abandon their normal routines and start spending large sums on products (and with companies) they’ve had nothing to do with in the past. Delivering a seamless, intuitive customer journey whilst protecting both your business and your customers from fraud becomes a key challenge for finance brands. In these ways, Cyber Monday highlights key issues for businesses, particularly in IT security, but also in stock control planning, logistics, HR, finance and marketing services. It does so as part of a global conversation that every B2B buyer is primed to pay attention to. Marketers who use this occasion to deliver timely thought leadership that addresses these issues can dramatically increase awareness – and go a long way towards securing their place on future RFPs. In recent research from Edelman and LinkedIn, 41% of C-Suite executives and 37% of business decision-makers said that they had added an organisation to an RFP opportunity as a result of seeing its thought leadership content. Both audiences agreed that relevance and timeliness are crucial to whether they engage with and value that content. The importance of tackling subjects at the top of an audience’s priority list is what makes Cyber Monday such a significant opportunity. The issues that are spotlighted by Cyber Monday apply to businesses throughout the year – so it may be that you already have in-depth content assets such as reports, eBooks and posts on your company blog that are relevant. This is your opportunity to remix these assets and bring out their relevance to the Cyber Monday conversation: repost existing blogs as thought leadership on LinkedIn, promote eBooks and other assets through Sponsored Content, and turkey slice relevant research to create opinion posts, how-to guides, infographics and other assets. Communicate relevance clearly by referencing the hot topic of Cyber Monday specifically in the headlines of your posts and Sponsored Content. Combine this with phrases that demonstrate exactly what type of value your content will add. Our analysis of the world’s most successful content shows that practical posts with ‘how-to’ oriented headlines are particularly effective amongst B2B audiences. If you have a provocative point of view, mix up the phrases in your headline to help draw attention to it. Phrases such as ‘This is why…’, ‘The best…’, ‘Why you…’ and ‘Meet the…’ all score above average when it comes to shares on LinkedIn. Business decision-makers and influencers value content that is short enough to be easily absorbed, but not so short that it fails to tell them anything they don't already know. Tech audiences and Marketing audiences are both more likely to share posts that are over 1,000 words long. In order to stand out in the conversation, you need to incorporate original thinking or unique data and analysis – but make sure that you communicate the immediate relevance and value of these assets quickly. Our regular round-up of the most effective Sponsored Content on LinkedIn shows the value of going visual and mixing up formats when it comes to standing out in the LinkedIn feed. Use striking and unusual imagery and consider where quick and creative video content can add value by communicating your ideas. Nanographic formats pulling out impactful stats from infographics can also be very effective. Delivering a sequence of related and relevant content will keep you front of mind and prime audiences to pay attention to what you have to say. If you’re running a Sponsored Content campaign around Cyber Monday, include different creative assets in the same campaign. This enables our algorithms to optimise spend around those driving the most engagement. Then swap in new content assets regularly. Remember too, that this opportunity doesn’t end on 28 November. Plan a sequence of content that extends after Cyber Monday, with reference to learnings, analytics and the importance of planning early for next year. Identifying the moments that will drive the agenda for your category can have a dramatic impact on the effectiveness of thought leadership on LinkedIn. Cyber Monday is just such a moment. It acts as an open invitation to demonstrate how your business can help address some of the most important challenges that your potential customers face. In the B2B space, Cyber Monday isn’t necessarily about bargains. Instead it’s about value: the value that you can offer to potential customers in addressing pressing issues at a crucial time of the year. Businesses will never be more focused on the security and robustness of their IT infrastructure and the dangers of cyber attack, in particular. This is your opportunity to lead that conversation.